If you don’t know anything about M.U.L.E. yet, I suggest you read the General introduction to the M.U.L.E. legacy first. M.U.L.E. was originally developed and released for the Atari 48K Home Computers in 1983. The Commodore 64 version followed afterwards. Both versions of M.U.L.E. 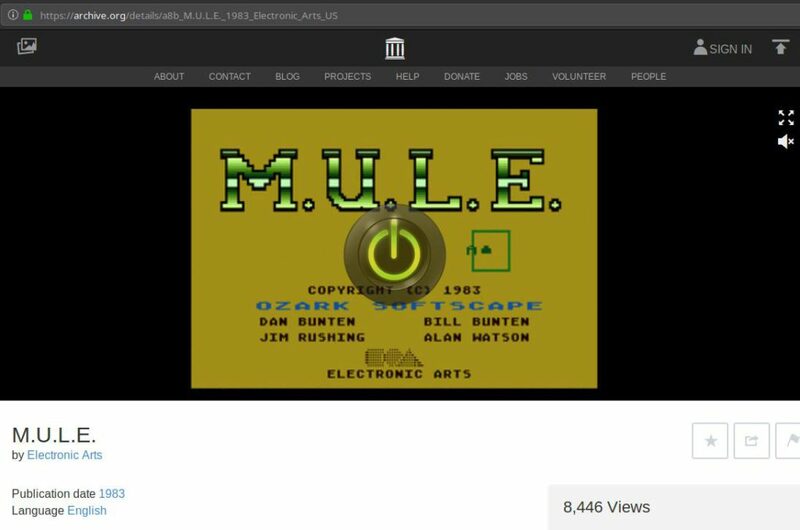 are considered to be the “original” versions of M.U.L.E., because they were developed by the original Ozark Softscape developer team (Dan Bunten, Bill Bunten, Alan Watson, Jim Rushing, Roy Glover). All subsequent ports of the “original” M.U.L.E. (see other Classic M.U.L.E. games) were developed by different developer teams. “Original” or “original original”, and does it make a difference? The Atari 48K version is the “original original” version, because it was developed and released before the Commodore 64 version. One has to know: Among M.U.L.E. fans, there is an age-old bickering going on with regard to which of the two original versions (Atari and Commodore) is the “better” one. With this report, I will try to stay as objective as possible. I really don’t want to fuel this bickering… Therefore, the “Gameplay” section focuses on describing the differences between the Atari and Commodore versions objectively. To the Atari fans: Awesome game, but please don’t bash the Commodore version fans – their version is awesome too! 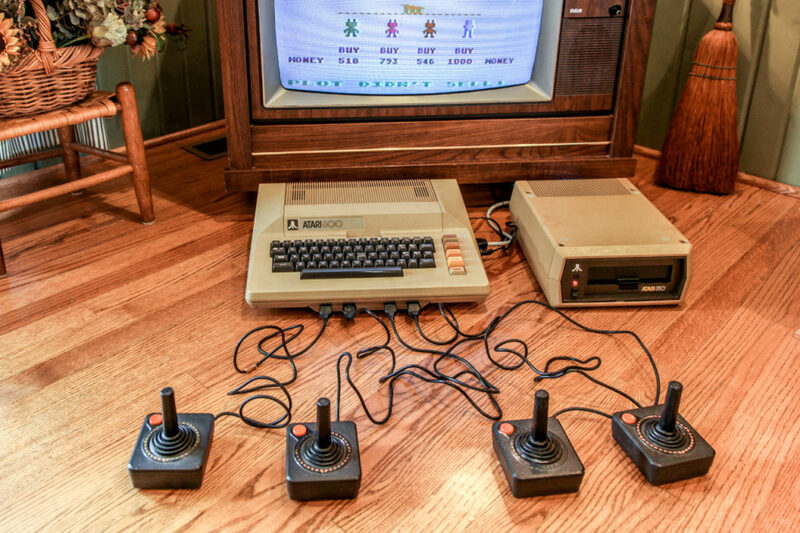 To the Commodore fans: Awesome game, but please don’t bash the Atari version fans – their version is awesome too! Who knows… Maybe one day, we will see an amalgamation of the two code bases (Atari and Commodore)… Or even an amalgamation of three code bases: The rare and little know IBM PCjr version of M.U.L.E. is extremely faithful to the original Atari and Commodore versions, nevertheless introduces some cool new features to the game, like for example the option to play more than 12 rounds. During the many years I research and collect “all things M.U.L.E.”, I have decided that it is time to write an “executive summary” of all the interesting bits and pieces I found. The quickest way play the game is to make use of the Archive.org Atari 8-bit software library. Archive.org hosts a web-based Atari emulator running directly inside your internet browser. However, you can’t use a joystick (or even four), so you have to play with the keyboard. Emulating Atari M.U.L.E. on modern PCs. Even internet online play is possible, if you are a bit versed in computer and network administration. Emulating Atari M.U.L.E. on a Sega Dreamcast for local four-player, four-joypad fun. The Sega Dreamcast is an ideal machine for this because of it’s built-in four joypad ports. Gameplay comparison with Atari/Commodore M.U.L.E. …the time limit feels tougher. On the Atari it is very rare that I can equip three plots on the planet during one turn, whereas it is very common on the C64. …the “Planetquake” event is much tougher, because mountains are shifting, causing two M.U.L.E.s to be destroyed. That is especially gruesome early on in the game. …it is possible to drive the colony score to astronomical heights during the month 12 auction, when two human players collude. That is not possible on the C64. Together with the Commodore 64 version, only about 30.000 units were sold. Piracy is to blame. There are rumors that different versions of the game exist, though these could neither confirmed nor denied. Rumor is heated through some statements of Anne Westfall (source for this rumor missing unfortunately! ), who once claimed that she was very good at M.U.L.E. because she “could memorise all the 128 different playing fields” of the game. While browsing the net, I only found two versions of the game disk image. A presumably corrupt one where some graphics in the town are not displayed, and a “good” one, the one you can download in the file gallery. Any information concerning those mentioned “rumors” is greatly appreciated. MobyGames entry for Atari M.U.L.E. AtariMania entry for Atari M.U.L.E.